Damn, that's a game changer. Sorry for her that she has to miss her final NCAA Tournament. That really opens up that bracket. Don't know if it's a game changer. Feel really sorry for Coates. She seemed like a hard working classy player. But SCar didn't look really diminished without her. Opened things up for Wilson and Davis. Not sure they will miss her that much except against a tiny number of teams like Baylor (who they'll probably never face), or if Wilson gets herself into foul trouble. Sorry she misses her last tournament though. Don't want to see anyone get injured. What a sucky way to end your career. Get well soon, Alaina. With that being said, I agree with Art that South Carolina doesn't look terrible without her. In fact, I think they look good for the aformentioned reasons. Very smart of Dawn to wait till the day after the selection show to announce she's done. Player availability can affect seeding and I wonder what the committee had done had they known Coates would be out? Would they still have been the #3 overall seed. She probably did that so they would get OKC, but we all see how that turned out. While I agree, and said so months ago, that SC operates better with one tower on the floor at a time, to think this doesn't hurt SCar. 's chances (and thereby boosts all their opponent's chances) is wrong, imo. to think this doesn't hurt SCar. 's chances (and thereby boosts all their opponent's chances) is wrong, imo. Chances to do what? Win the tournament? This doesn't affect their odds at all. They had a 0% chance before and they have a 0% chance now. Sorry for her and her team, but in reality, this isn't a game changer for South Carolina at all. They had no chance to win the national championship either way. This just makes the road to 5 in a row a little bit easier for Uconn. Or she just booked her ticket to Spokane for next year!!! Lesson #1 - Don't piss off selcom (or make them look bad). No one going to slam Staley's decision to play Coates on that ankle in the semi-final game of the SEC tourney against Kentucky? Actually it makes it easier for Notre Dame more than UConn. I remember a couple of posts, made moments after the re-injure, which did. I had a feeling this would happen with either Coates, Alexis Jones, or Stephanie Mavunga. On Monday night all Staley said was Coates didn't practice this week. Then Tuesday morning after the bracket is revealed Coates is out for the whole tournament. Is this a little deceiving? It makes Staley's complains about regional placement a little hollow when to be honest they are fortunate to get a 1 seed with Coates out. On the men's side Oregon announced when their top post player Chris Boucher was lost for the year and they were honest about it before the brackets were out. They could have been coy about it but they were truthful. I think on the men's side they are maybe more critical and they wouldn't give teams the benefit of the doubt on an injury but on the women's side I feel like its the opposite. Imo, it lessens their chance to win any game they play. It could be the difference between making the FF or not, and it certainly doesn't help them guard Turner, should both teams make the FF. Actually probably doesn't affect Notre Dame either. Makes it easier for Oregon St or Florida State or Miami. Stephanie Mavunga is suppose to be practicing this week and the expect her if we win the next two games per the Columbus Dispatch. Was this announced after the selection? Because before I only read very generic stuff saying they hope she is back "soon." Its sort of the same thing with Coates and Jones. Finding information on their return was very hard, probably purposely because of seeding. Today, game time decision, but more likely not, if they are consistent in there normal "talking points." It is a shame that the very few minitues that Coates played in that last game will cost her the remainder of her college playing career. That is a huge price to pay for such a short time. 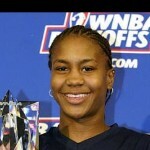 I hope she is all better come wnba draft time. South Carolina is one of my favorite teams and I love watching them but agree with some others that they wouldn't win the ship. Yes the team has won without her but a few games is very different thing than the NCAA Tourney. A'ja MUST stay out of foul trouble and I think Bianca should play more time. She is a great thief and gets the ball quickly up the floor. Davis has to have a great game EVERY game. I think their slim chance of winning the title was just regulated to the bench. I feel really sad for Coates and the team! IIRC, one of those two occurred after the selection.